Another designer friend of mine recently found ourselves in the same predicament. We couldn’t seem to get to work any earlier than 10am. Luckily, our companies don’t require us to be, but with all of the things that need to be done in the morning (showers, breakfast, dog walks, long commutes) rushing around in an hour just wasn’t cutting it. The solution? Waking up earlier. I’ve been nocturnal since I can remember, even at age 10 I loved the nighttime and hated mornings. It wasn’t about loving to sleep in or needing more sleep than the average joe, but creative juices just flow better at night. The solitude and calm of being able to get things done with no distractions is wonderful, I’ve always been able to do more at home than in the office. But as I’ve grown up, and recently gotten married, it’s more important for me to be on a similar schedule as my husband and the dogs, and be able to spend as much time with them as I can. Meaning, get to the office earlier so I can get off earlier. This entry was posted in How-To, My Design Work, Uncategorized by michelleblackshire. Bookmark the permalink. I have been researching the exact same thing. Still yet to take control of it. 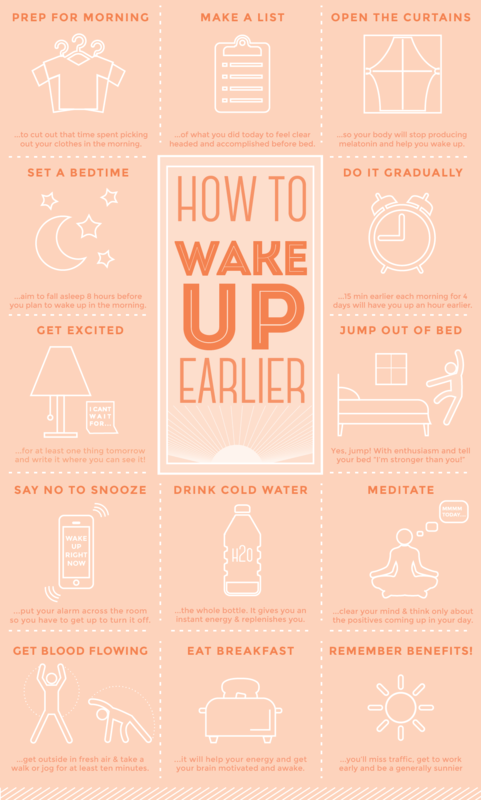 I like the advice of simply waking up 15 mins earlier than the day before. I think I’ve just read through your whole blog. Really connect with a lot of your stories. I’m studying web design but desperately trying to improve on my graphic design skills as well and your work is beautiful. Found your blog through Pinterest where someone had pinned one of your post about the free fonts. I am also late riser. Wish to change my routine since long. I found your guidllines very helpful. Thanks a lot. But I need more guidance, if I wake up 2 or 3 hours before my regular time rather 15 earlier.